At the forefront of retina, macula, & vitreous care. 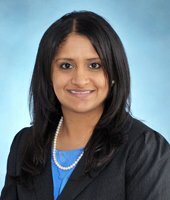 Ruchita Doshi Amin, M.D., attended Miami University, where she received a B.A. Honors degree in Biology. Dr. Amin earned her medical degree at the University of Cincinnati - College of Medicine followed by an ophthalmology residency at Rush University Medical Center, where she also served as Chief Resident in her final year. She completed a Medical Retina Fellowship at Northwestern Memorial Hospital. Dr. Amin is certified by the American Board of Ophthalmology. She is a member of the American Academy of Ophthalmology, American Society of Retinal Specialists and Women in Retina, American Medical Association, American Medical Women’s Association, and Michigan/American Association of Physicians from India.